During my recent trip in Japan, I never expected to find a place like Bean Stop. 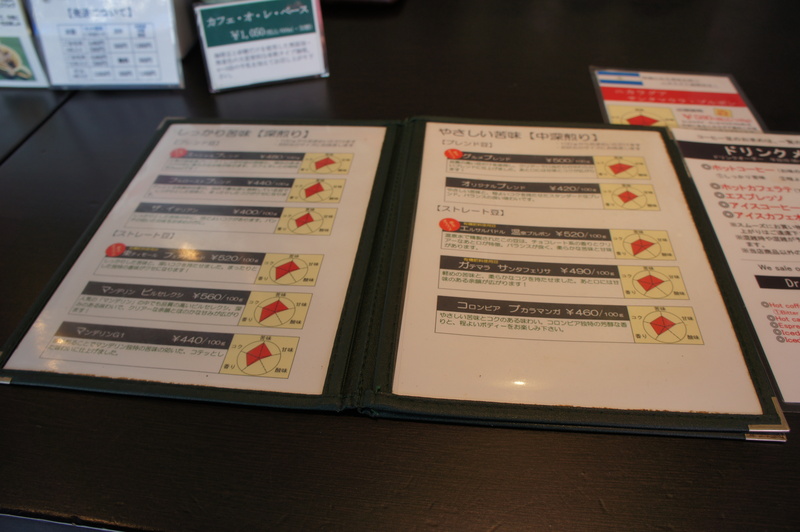 Earlier in the week, I had read an article about “Kyoto Coffee Culture” and was not thoroughly convinced. As much as US shops seem to indicate that “artisan coffee is booming in Japan” with the Kyoto Drip trend, I have traveled to Kyoto many times and never seen any indication that there is a “blossoming industry.” Coffee is a daily essential in many parts of Japan, going out with friends to a cafe is a regular thing, but going out specifically for a specialty cup of coffee, made fresh by hand in a pour over or cold-drip to exceedingly high standards, seems to be one of the less important aspects of the process. Coffee culture in Japan, in my experience, seems to be more about finding a “spot,” a nice place to get food, sit with your friends, relax, or take a break from the outside world with some brew. Wonderful, totally part of my philosophy about coffee. But it does detract from how West Coast coffee culture depicts Kyoto. 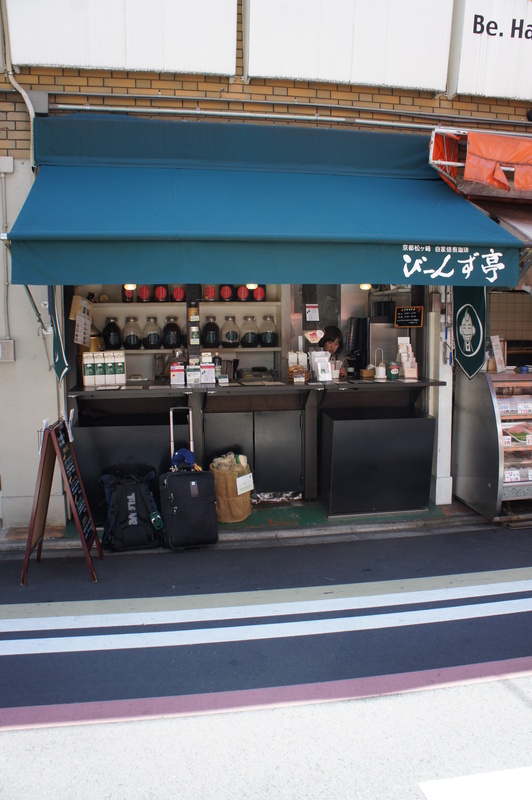 On an early morning excursion around Kawaramachi through the market district, I stumbled upon this small, unassuming stand, simplistically laid out and welcoming to those seeking some quality beans. As I stood and gawked a little, I began to notice that this stand was anything but ordinary. This area of Kyoto is known for its streets lined with specialty food stalls carrying high quality products. Frequented by locals and tourists, it is an attractive avenue. びーんず亭 (Beans Stop) fits right in with the scenery; simple, understated, professional, and personal with quality products that matched the service. Though heartily greeted, in my dumbfounded state, I think I replied halfheartedly. I was so surprised by the existence of this specialty coffee stand that I was strangely skeptical. Could a “good” shop be this unassuming? Was this a “diamond in the rough”? I politely declined a drink and walked away, almost instantly regretting my decision. Later that afternoon, I badly needed a pick me up. I decided to go back, find Bean Stop, and at least give it a shot. Despite determination, I found myself spending over half an hour in 92 F, 70% humidity weather trying to find it to no avail. This added to the strange level of mystique I felt about the store; just as suddenly as it appeared, it was nowhere to be found again (legendary??). Disappointed, I went back to my hotel and thanks to the beauty of the internet, I simply looked up the address for the following day (myth busted). The next morning, I returned to the stand, greeted by a young woman who was equally as cordial. As you can see from the photos, this shop is the real deal; there is so much care and thought put into the process of coffee that I think most people would be sold on the level of professionalism alone. In Japanese, you could call this こだわり、obsession to detail and proper execution. Flavor profiles, visual charts of cupping attributes, detailed origin information, it’s all there. My Japanese is not outstanding by any means, but from my brief reading of their literature and conversation with the barista, I could tell an immense amount of care was put into this store. Most important, with all its skill, precision, and quality, Bean stop had something that most stores lack; heart. It is cozy, straightforward, and intimate, something nostalgic, a throwback to a different era. Since the stand only offers coffee, I went with the “standard.” Customers essentially have two options at the store: buying whole beans by the 100 grams or a cup of coffee. Those who just want a drink can enjoy the house blend at either light, medium, or dark roast. Naturally, I went with the light roast. It was smooth, clean, and flavorful, meeting my expectations. One caveat, the “light” roast is definitely “light” in terms of a Japanese palette and by that standard, it may come off as dull. Those who are expecting a light coffee bursting with flavor and fruitiness may be disappointed. The medium is more likely what you will want to choose. The barista and I enjoyed a brief conversation as I stood at the little bar to the side of the stand, sipping my light blend in the morning sun. Just what I wanted out of my morning walking adventure. Perfect happenstance for my trip to Kyoto.